My crazy Aunt Gaye and Jerry came by for a visit this week on their world tour from St. Louis (via the Stick). We had a great time together. Aunt Gaye brought some art along as a gift for staying at Coal Stove Sink (an unnecessary but very welcome happenstance). We’re still trying to figure out where to put this gorgeous work up. 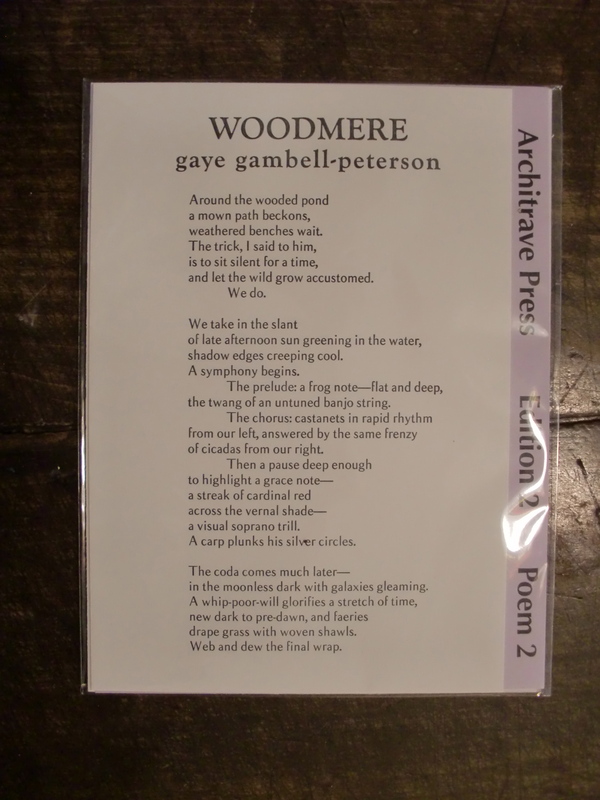 Also in hand, the poem Woodmere typeset by another artist in a specially designed typeface. The letters are beautiful and are inspired by the poetry. As far as we’re concerned, Aunt Gaye can come visit whenever she wants. We paid her back withe a Liberal or two accompanied by the Bitter Liberals.